Trinity College School was awash in the vibrant colours of our global community as the Cultural Awareness Group (CAG) hosted its annual International Day on Wednesday, January 31st. As a cold and snowy month came to a close, the School was cheered by the sights, sounds and flavours of the many countries that make up our student body. The day kicked off with a special chapel service in Cirne Commons, with Grade 12 student Lauren Miller serving as emcee. 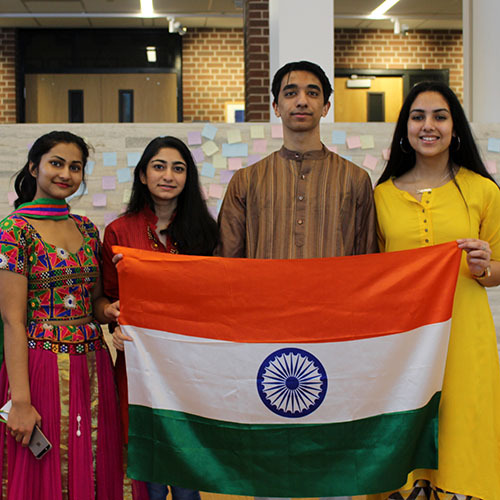 The parade of nations saw students bearing flags and traditional clothing of their home countries or those of their ancestors, with a slideshow and music playing the background, created by Grade 12 student Ganden Gyaltsan. Grade 11 student Nita Das performed a beautiful dance honouring her country of India. And students learned fun facts about countries from Canada to Zimbabwe. During lunch, the talented team in the culinary services department created an international feast, including udon noodles and rogan josh, as well as fish soup with dumplings. And during afternoon flex block, Cirne Commons again was awash with colour and music, with a performance by Northumberland Multicultural Dance Troupe, led by Thelma Dillon. The show began with bagpipes and moved through dances hailing from the Philippines, Mexico, South America and Spain, as well as belly dancing! When students weren’t having fun trying Zumba moves and using Filipino dance sticks with the dance troupe, they were sampling amazing foods from an international market created by our students. There were noodles from South Korea, bubble tea and pineapple cake from Taiwan, pancakes and maple syrup from Canada, fish balls from Hong Kong and semolina cakes from Cyprus. As well, Nita Das organized a booth to provide beautiful henna designs for eager students. The day was filled with smiles and laughter, but was also a strong reminder of how fortunate we all are to live and learn in such a diverse international community at TCS. Thank you to the CAG leaders and all of the students who shared aspects of their culture with us, as well as to the property and culinary services teams for making this day possible.